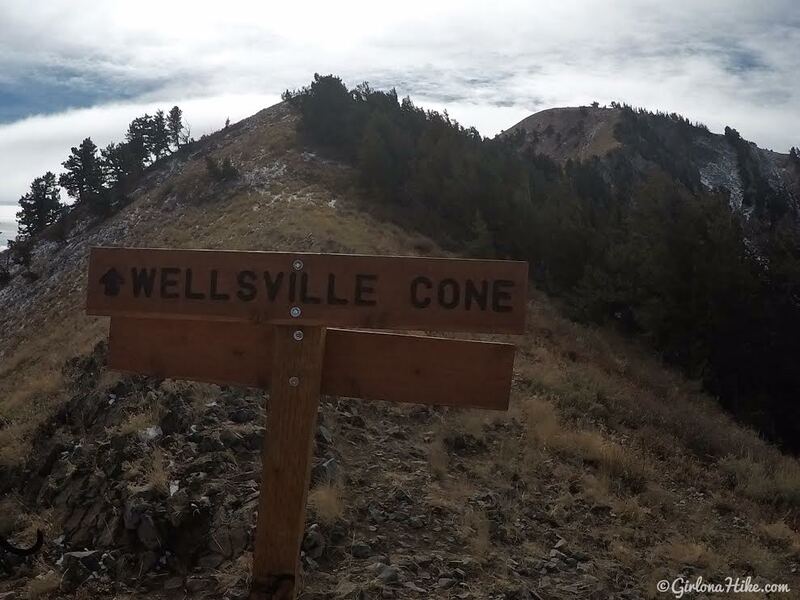 The Wellsville Cone (9,356 ft) is the 2nd highest point in the Wellsville Mountains, the highest being Box Elder Peak. 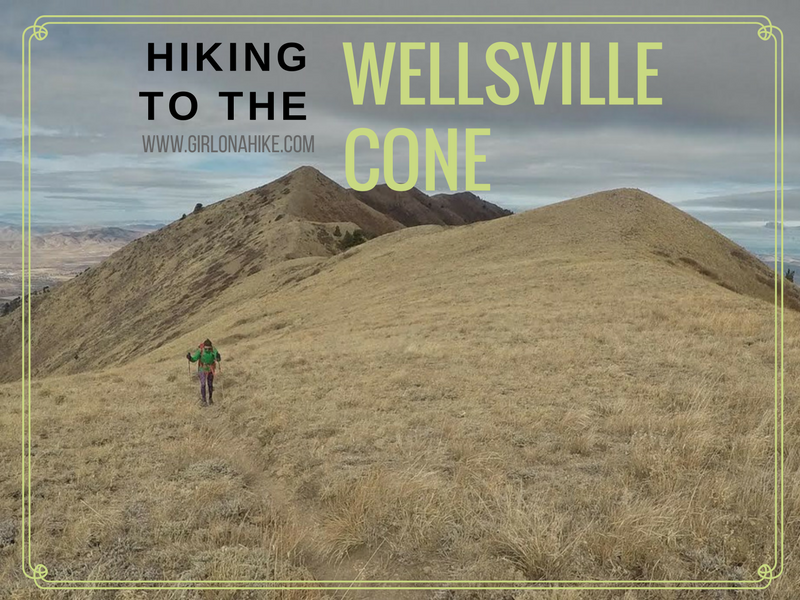 Wellsville Cone is only 16 feet lower, and if you must bag the tallest peak of the mountains go for it, but the views will be the same. There are several routes to reach either summit and all require bushwhacking, and are long, steep hikes. Coldwater Canyon/Maple Bench This is the route I will be describing. It's 10 miles RT and gains 3200 ft elevation and shortest route. The TH starts on the East side of the range near the town of Mendon. 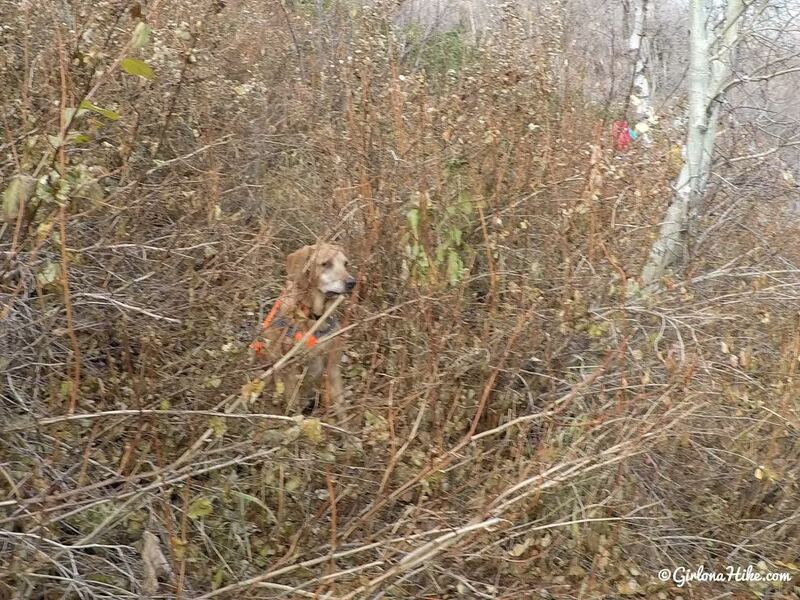 There are three long sections of major bushwhacking. 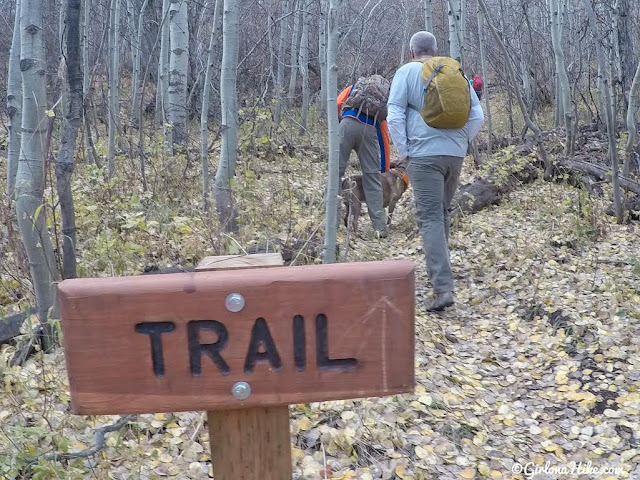 The trail is always visible in Fall, however in summer when the trees are in full bloom it will be very easy to lose the trail. I highly recommend you go in late fall to be able to see the trail. Rattlesnake TH This route starts from the southern end of the range, and is roughly 11 miles RT as well. 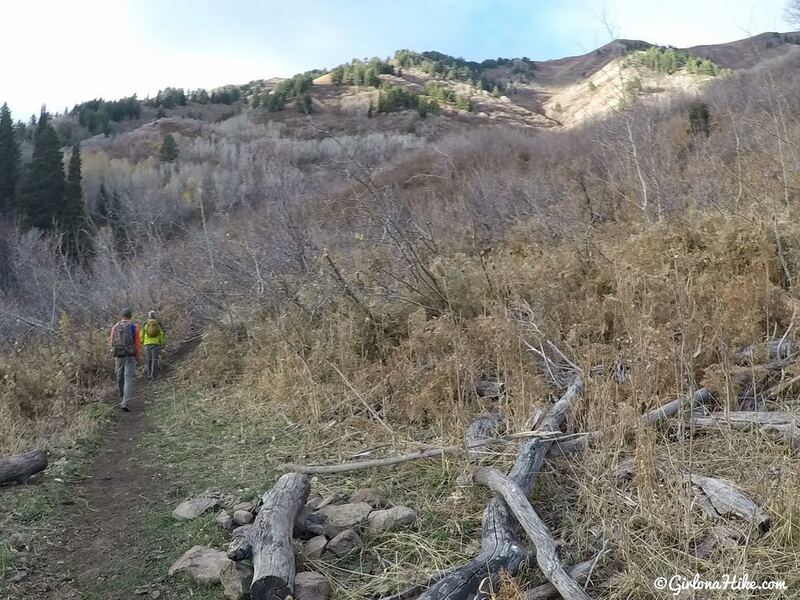 Recent trail reports say fallen trees, very easy to lose the trail, and trail is completely overgrown. Deep Canyon TH This route starts from the northern end of the range, and is the longest route at 13 miles RT and gains 2900 ft. Taking this trail will also allow you to bag Mendon Peak. Most popular TH. West Coldwater TH The least used trail that climbs to Stewart Pass from the west side of the range - it's said to be steep, rarely used, hard to follow in places. Be prepared to carry 3 liters of water, as there is no water source along the Coldwater Canyon route, besides passing by Coldwater Lake which is really more of a mucky pond. There's also very little shade, and I wouldn't recommend hiking this in Summer. In winter, the gate is closed from the Coldwater canyon side, so the best time is Fall. 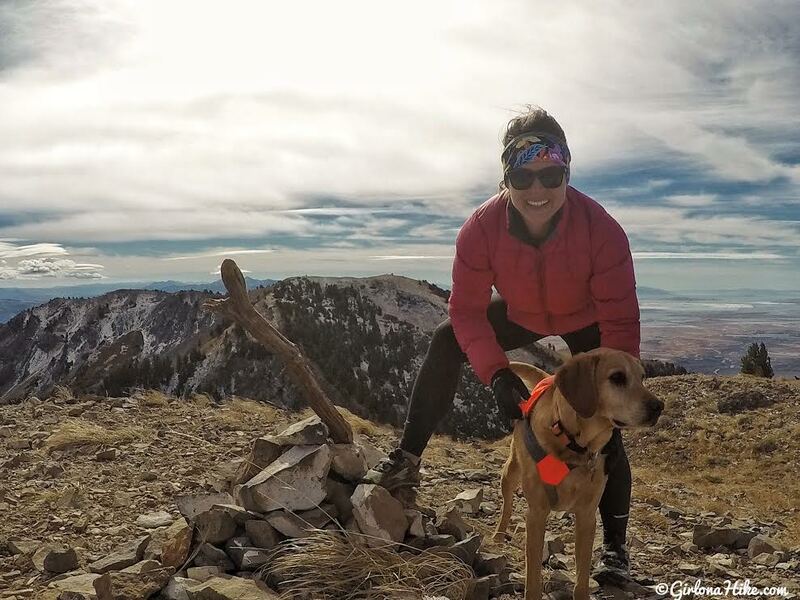 Dogs are allowed off leash but they should be able to hike for long distances, and over rocky terrain. Dogs will need at least 1 liter of water. If you are driving from SLC, head north on I-15, and take exit 362 towards Logan, UT. Drive through the canyon for16.5 miles and turn left at the small sign for Mendon, UT. 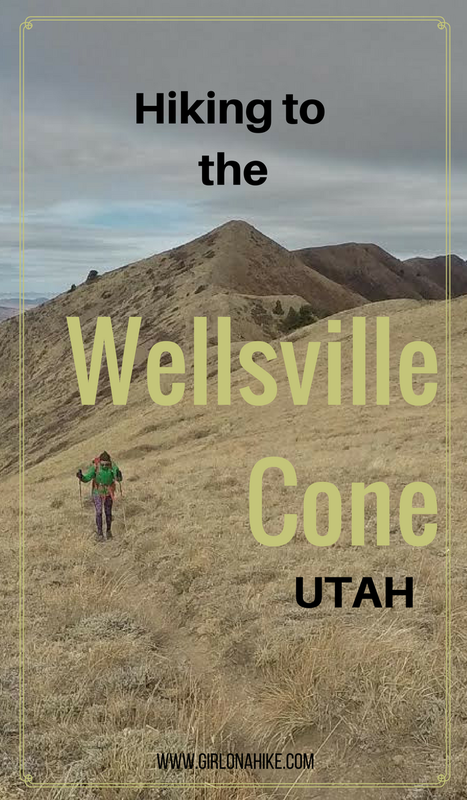 Drive through the small town of Wellsville, and from HWY 23 turn left on 5400 West/Main St (it's another really small street sign, so be on the lookout. If you drive into town past S 200 W, you went too far). Once you make the sharp left turn onto 5400 W, immediatley turn right at the next road, which turns into a dirt road. You'll drive be several large homes. From here, keep following the dirt road until it ends at the TH. 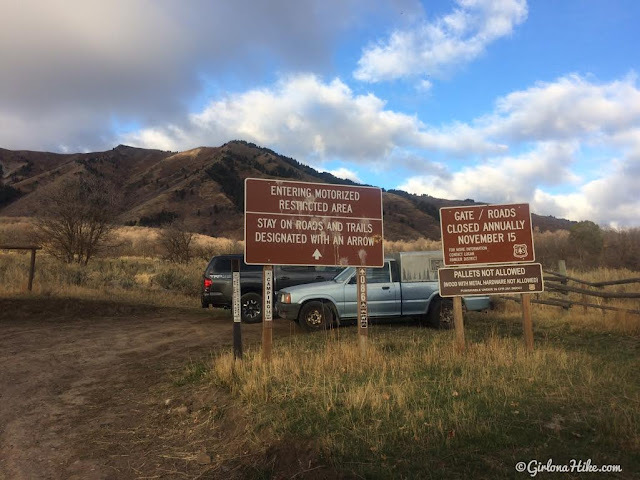 You'll pass the national forest sign, and cross one cattle guard - I've marked both on the map below. 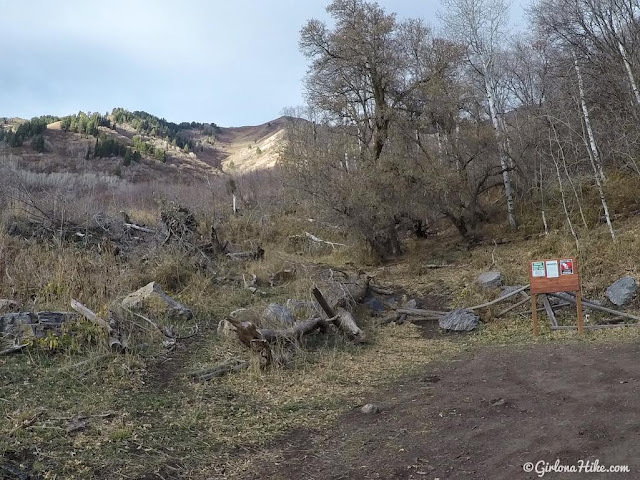 Using Google Maps doesn't work because it doesn't recognize the end point/trailhead. Most cars should be able to make it. Small cars will have to drive slowly. It also depends on road conditons - if its muddy you'll either need 4x4 drive or just walk up the road, but it does add on an extra 3-4 miles one way. As you drive along the dirt road you'll pass the winter gate, which closes November 15th. Keep driving until you reach the end of the road. The trail starts behind the wood sign. 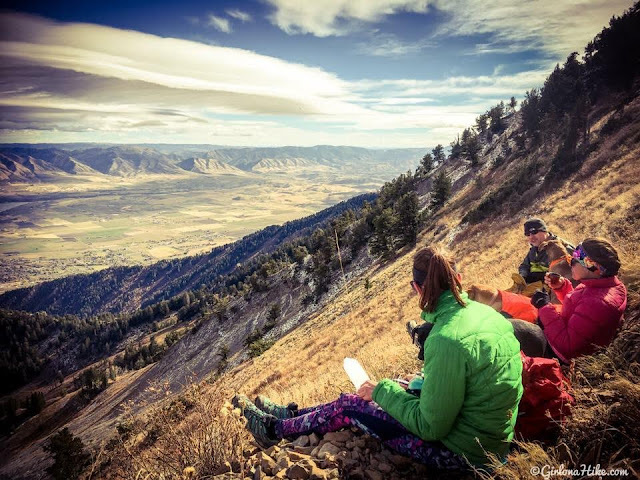 You'll hike in a southerly direction for the first mile. The last remaining Fall colors! I know, this is a horrible photo but there's no good way to make Coldwater Lake look pretty. 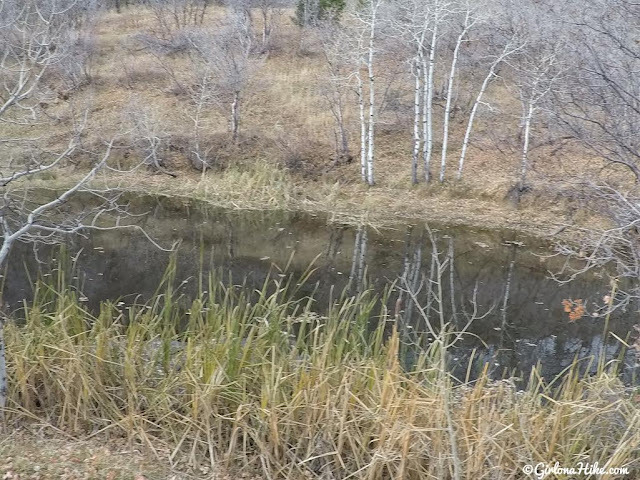 It's really a mucky pond 50 ft long by 15 ft wide. Keep an eye out for the nice trail sign, and turn right here. 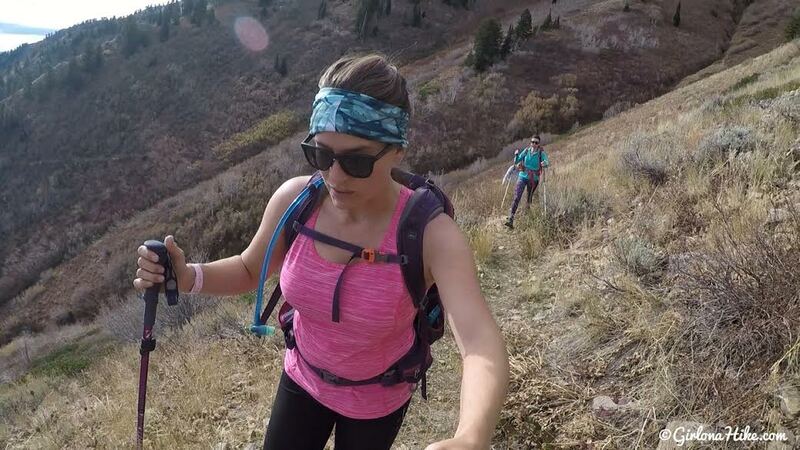 You will begin hiking uphill. The frist section of bushwhacking...you can barely see Charlie. 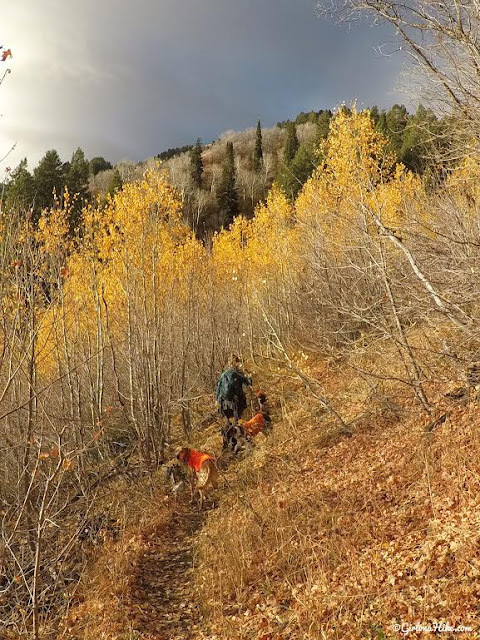 I really don't know how you'd be able to find the trail in Summer when everything is blooming and covered with leaves. Make sure you wear pants and long sleeves on this route to protect your skin from getting cut up, and don't wear your "nice" hiking clothes. Finally the bushwhacking ended for the next 1/2 mile and we hiked up several switchbacks. 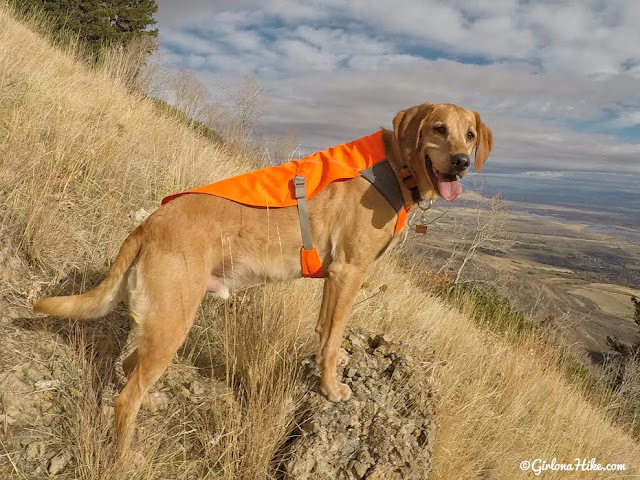 Charlie, the happy hiking dog! Some parts had remaining snow from the last mini storm Utah had, but it warmed up making sections extremely muddy and slippery. 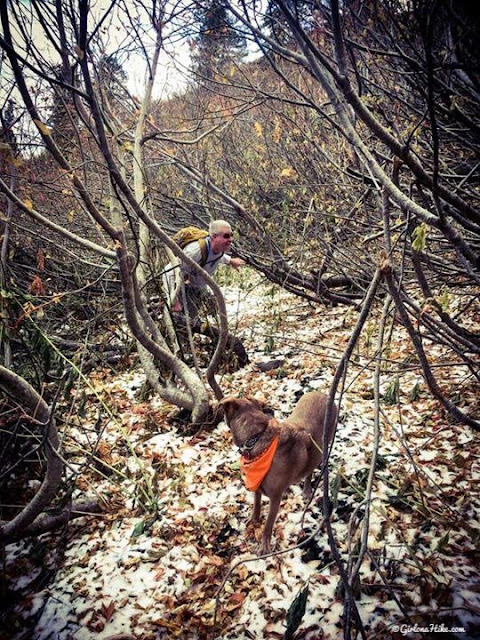 Dan & Mama-dog try to find their way through the second stretch of horrible bushwhacking. 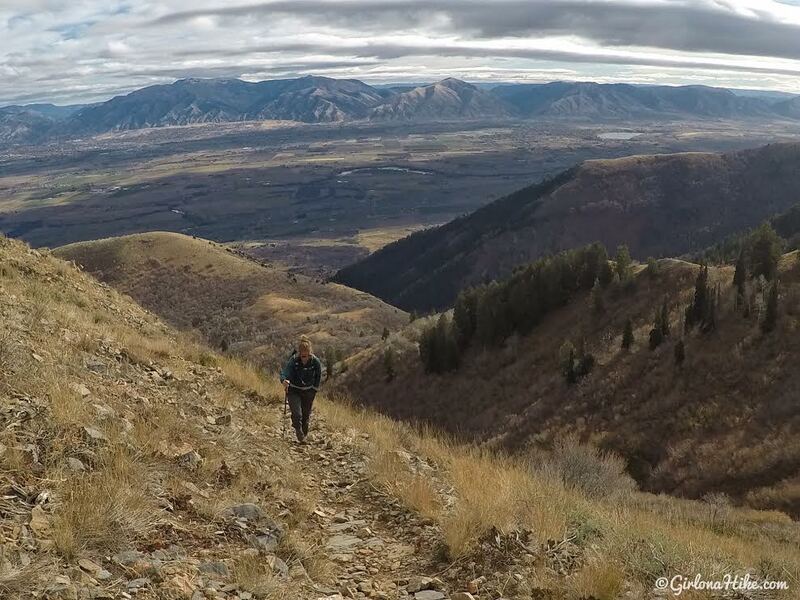 When the trail opens up, you really do get nice views. This is looking East towads Logan. Eventually, we made it to the ridge. Relief! 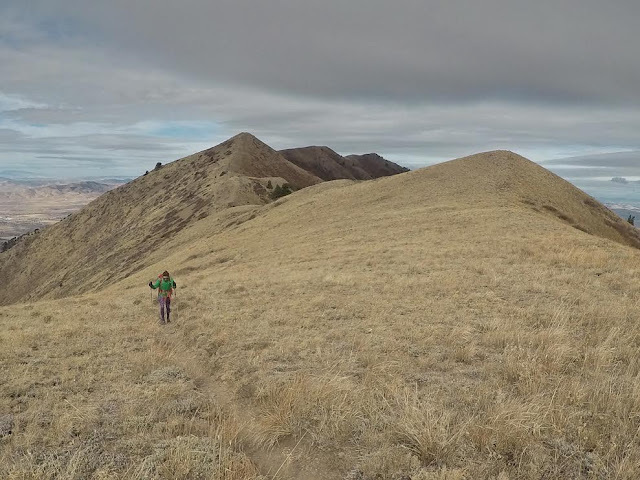 I knew the clouds kept taunting us of bad weather, but what we got instead was insane winds along the ridge, also making it feel 20F colder than it actually was. 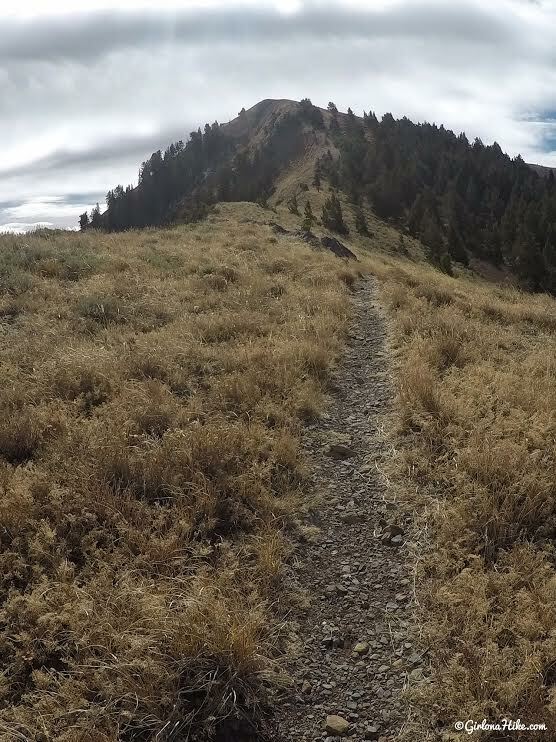 This is looking back towards Mendon Peak. When we hiked along the ridge, we all thought this first peak was the cone, but it's not. You'll hike around it to the other side, where the trail keeps going. 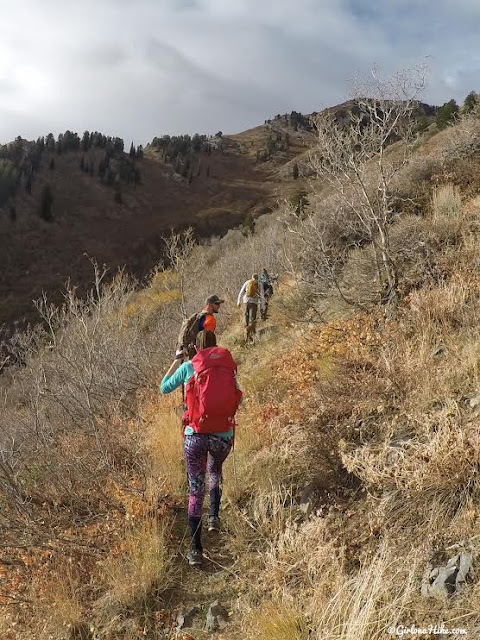 At this point, the wind and cold was really wearing us all down. 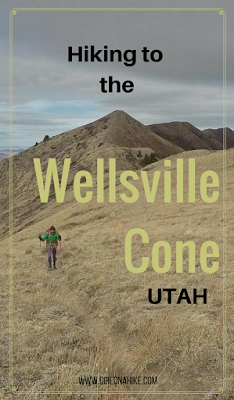 Reaching another sign for Wellsville Cone! I thought it was really interesting that there were such nice, new-ish trail signs, yet the trail itself was in poor condition. 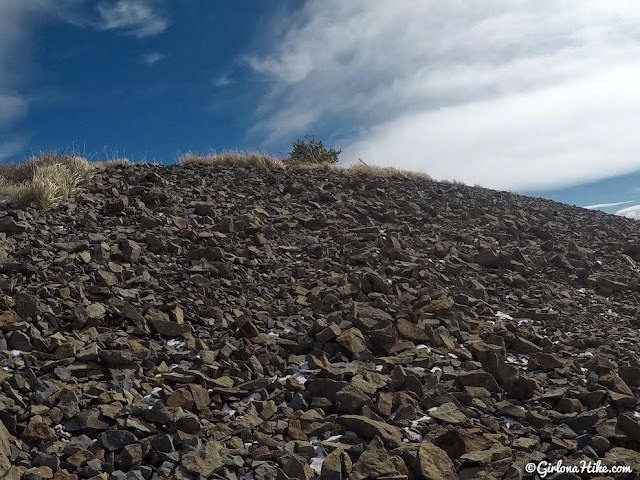 You'll hike up a few switchbacks when you get close to the summit. 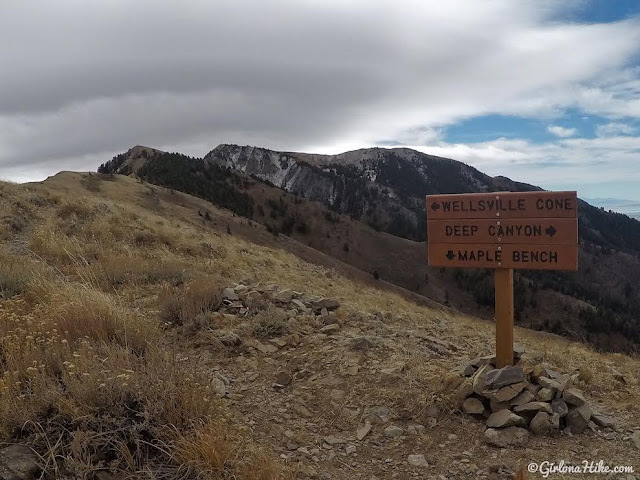 This is looking down into "Brushy Canyon" basin. 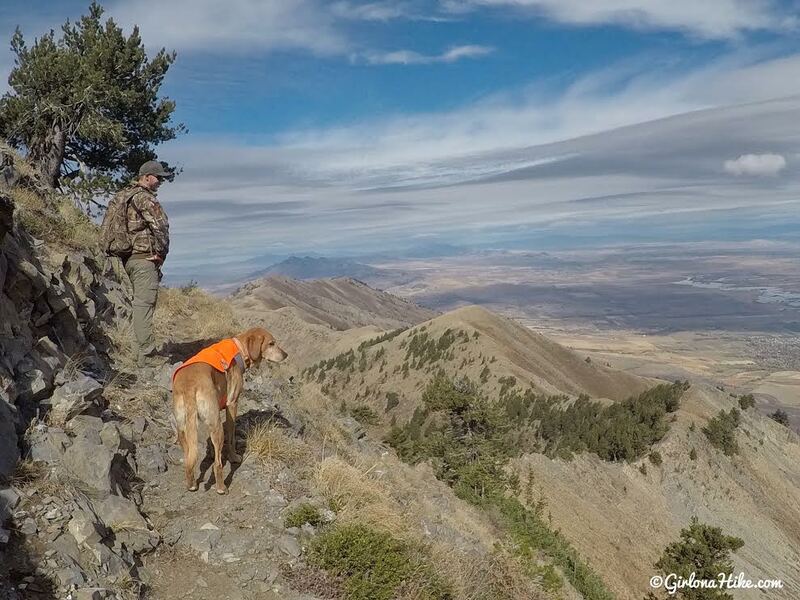 Great view of Box Elder Peak. We originally wanted to summit Box Elder as well, but we were all exhausted by the wind and steep hike up that as soon as we saw how far away it was (1 mile), we changed our minds and skipped it. 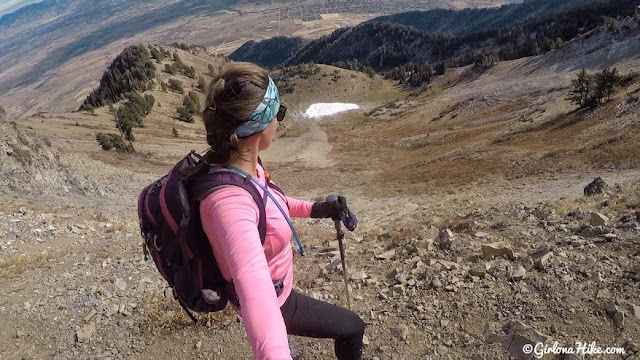 Last push to the summit! Finally! We summited the Wellsville Cone. It took us 3 hours 36 minutes. 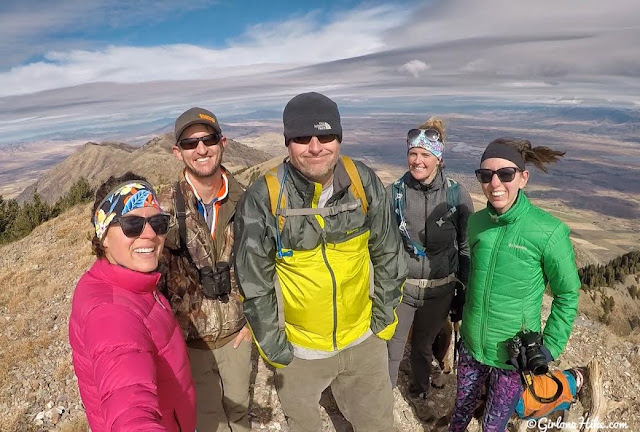 It was SO COLD and windy that we quickly got our photos and headed down. You can see by Heather's pony tail how windy it was! 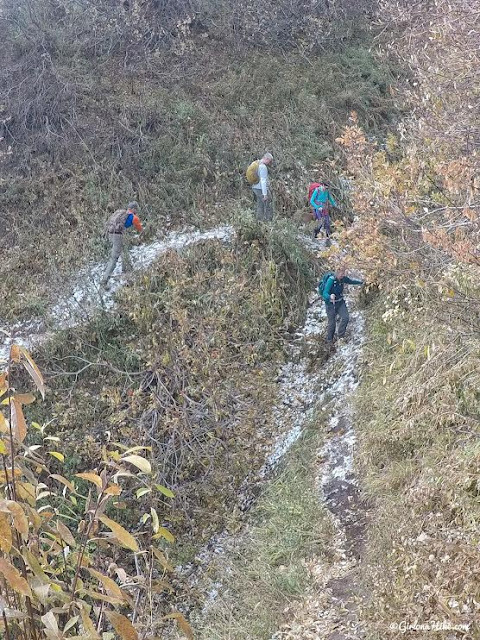 In order to eat and have our hot drinks, we hiked back down to the switchbacks just below the summit so we would have a break from the wind. I'm glad I did this hike, but in all honesty I would never hike here again. It was really steep with lots of bushwhacking and combined with the wind it just wore me out. 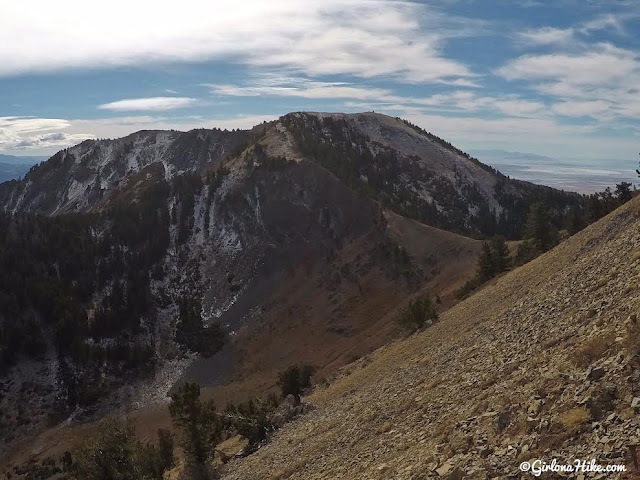 The views from the ridge and summit were amazing, but otherwise there was nothing special about this range for me.